I actually read this chapter long time ago but then I was having trouble opening nutang, if not the blog would be updated a few days ago. Yes this blog entry will be about the second latest chapter of Naruto: Chapter 346: The secret of the new jutsu. 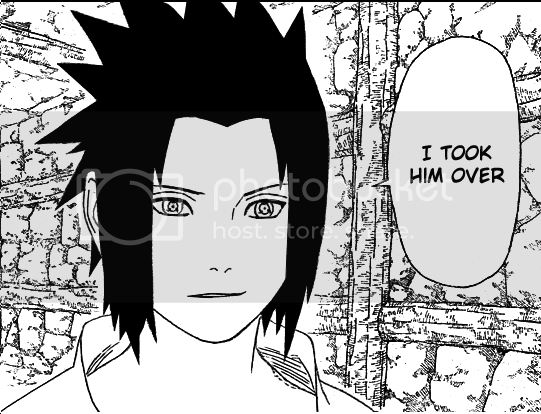 To be frank, I was not looking forward to read this chapter because it will mark the 'survival of the fittest' in Orochimaru's den and I hate to say farewell to either one of them: Orochimaru or Sasuke. But surprisingly, I took the results very calmly and I seriously got no feelings when one of them died: Orochimaru. Yes, my favourite villain of the century has finally demised in the hand of his successor or rather his 'container'. I just received this bad news in a nonchalant manner. In my heart, it goes "Die ... then die lo... no big deal." Hey, I'm a big fan of Orochimaru when did I changed 360 degrees??? Ok Ok... back to my comments. Short comments. Eew... Sasuke ... I didn't know you like to eat people but ... it's a good thing though because his closed friends and followers like Kabuto won't have to spend money or having a headache on his burial. And Kabuto doesn't even need to worry about grave ninjas .. you know grave robbers?? Yup that's it. So Orochimaru now can live forever in the body of Sasuke. 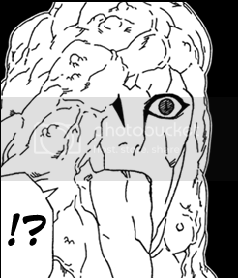 *Aiyo .. come on Orochimaru ... can't you just not stick out your tongue and emanating some question marks when you want to die?? Please die with more manners. Do Malaysian teachers take the word 'stupid' lightly? Let just say I'm now not in a good mood. I'm now in a distance learning class session now. The teacher [I won't call her a lecturer because I don't even know is if she has masters level] told to the class students that we will be having a progress test on the 29/3/07, which is next Friday. I disagree because I will be away for some personal matters which I have planned for one month ago. And then another thing is this teacher self-declared the date of the test. She just told the class we will be having a test at the end of the month. She said maybe 31/3/07. Right. A few weeks ago, I realized the teacher didn't send the course timetable at the beginnin of the class; the timetable that shows the dates of the chapters she's going to teach in a week and the dateline for assignment/tests/exams. I asked jolenesiah if her dumb dumb uni handed this out, she said yes. And why not me? Even my alma mater did that. So when I asked the teacher do you have the course schedule?? The reason I asked is to check if she really self-declared the test date. Then she debated with me that we, part-timers, have to juggle the time between work and study. Very true. But if you have given the test date on the first day of class, I won't even bring up this class schedule issue. So I just told her in class that you can't tell us the test date one week away from now. If you want at least 2 weeks away. So I just told her off that you didn't even give us a course schedule you have no right to set the date on your own inconvenience. You know what I heard? If I'm not mistaken, she said "I DON'T WANT TO ANSWER THIS STUPID QUESTION." If she didn't say this sentence, she still mentioned the word STUPID; loud and clear. But damn it, I didn't get to record it in time. So ... never mind ... I asked her what's the test format. She said she doesn't like to repeat and I always forget what she said. She said she has written it on the board and no I didn't see it. I suspected she did that on the day I was absent. What I want to point out here is be it teachers, lecturers or any kind of educators, the word stupid and other words that can degrade one's image or self-esteem should not be taken lightly. As an educator,you are a role model to the students. Patience and respect are an invisible virtue that is hammered into the hearts of educators and they are also the prequisite to be an educator. Respect because no matter how stupid the students are, they worth your respect. You can call the students stupid if you want the better out of them; you scold them because you care for them. So educators don't take these 'harmful' words lightly. Remember those times when you keep on asking someone to tell you how to do something repeatedly. And please don't think just because you are an educator, you are at the top of the education system, therefore, you are invisible. You are not. And please remember that as an educator, you are instilling values to the students to become a better person so please be careful with your words and actions. Because of some bad apples, some of younger generations or people the same as me are rotting; so oblivious and ignorant. Why are these people like that?? It is because of some educators. Because of you, some of the students think it is not their responsibilities to fight for justice. Because of you, some students think it is not important to know about the state of our environment. Because of you, some people are so selfish and have no compassion. Some bad apples really betray the trust of the parents ... how disappointing it is. *I'm saying SOME educators ... not all. Understood? Oh well, thank god I came back on time for my favourite American series called Heroes. Today's episode is very interesting. Interesting not because of the actions but the part where Claire's stepdad cried and begged Isaac to draw the future of his daughter. All I see him in the series is some kind of a bad guy but after looking at this part I believe that every villain has a hidden loving heart. They could do other people harm but not to their loved ones. How strange is that. What logic is that?? Maybe I should run some psychological test on this kind of villains. Claire's stepdad is so compassionate that he really adopted the baby girl where he was somehow involved in the death of her birth mother. He knows the baby girl will have powers one day and yet he takes the risk to adopt her even though his job is to spy on this kind of people. I'm kinda pissed today since morning but I'm more pissed after reading this article "Beyond Grades". Just wondering why can't I be rich when I'm young. Why do I have to see other young people with similar ages as me being rich while me somewhere in the world being so unsignificant and poor?? Man ... I need to be an entrepreneur too. If they can be rich, so do I. *Edit* This is the shortest blog entry I have ever done. Kudos to myself. In the middle of the movie, I just cringed to my seat. I just couldn't withstand some of the violent scenes; I can't remember the scenes at the moment. But I don't think this movie is controversial at all; Spartan represents Bush and the Persians as Iraqis? Not at all. Bush's definition of terrorism is defending your own country from him. But the Spartans are just simply defending their country from invasion. The story is just as simple as that. And the lessons are plainly stated in the dialogues of the characters like we have to fight for justice and we need to protect what we treasure most. So what is so controversial about this movie? I think the Sin City movie is as violent as this movie but I thoroughly enjoy these 2 movies. I had a good time on last Sunday because I was one of my friend's bridemaids - sort of - to give hurdles to the groom before entering the bride's house. My friend, the mastermind, made him do 30 pushups ... and then let him drink some coke mixed with sugar, dried chilli, salt, lime and vinegar. It was interesting. The most interesting part was getting two tops. Yea basically the guys had to take off their tops and the groom was given a chinese brush and ink to confess his love on their backs. Bwahahaha .. That was the funniest part. And then we asked the groom some questions... We pegged him when he can't answer the questions. That was only in the morning. I will always cherish the moments we shared together until the day I only live in memories.